Many people collect swords across America. 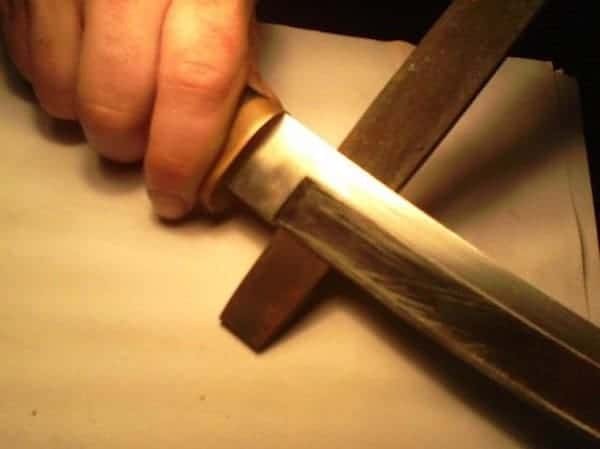 And although we predominantly offer advice on how to sharpen kitchen knives and hunting / sports knives, the same techniques and tools can be used to sharpen swords too. And let’s face it, if you have purchased an expensive collectable samurai sword, even though you will never use it in practice, you will still want to ensure that the blade edge is sharp. Another reason you may want to sharpen a sword is due to the fact some manufacturers sell them with dull edges, (a safety requirement). And if you do use your sword it will become dull through general wear and tear. Again, at some point you will want to restore that edge to pristine sharpness. In this article we are going to look at how to sharpen a sword with a simple file and a whetstone. We are big advocates of Japanese Waterstones when it comes to sharpening your sword. Of course which grit is a huge factor that most people are unsure of to begin with. We would advise that stones ranging from 800 to 12000 grit should be used to sharpen blades in good shape. Obviously the higher the grit, the less likely you are to damage your sword during the sharpening process, (important if you are a beginner). If a blade is in bad shape or has prominent chips to the surface, stones down to 80 grit can be used. With all this in mind, here are our top 3 recommended whetstones for sword sharpening. This is an affordable, easy to use sharpening tool. With the combination stone utilizing both 1000 grit (great for steady sharpening) and the 6000 side for fine-tuning, this is the sort of versatility a beginner needs when they set out to sharpen a sword for the first time. 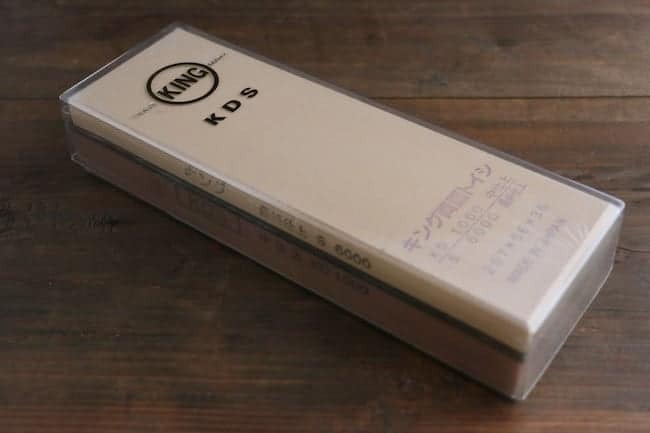 The Kai Japanese Professional Knife Sharpening Stone is a really nice stone to use. 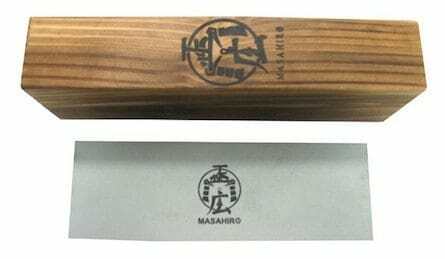 We have reviewed it in greater detail here, however for the purposes of this article the Kai is a great choice for anyone with a sword that requires some harder impact sharpening. The Kai is a combination Japanese whetstone, with a low 240 grit for some of the tougher work, and a 1000 grit on the flip side. The stone is necessarily recommended for complete beginners, however anyone with a little prior experience with a whetstone, will get a lot out of this tool. The Yoshihiro Professional Grade Toishi Japanese Whetstone 3 piece set covers everything you will ever need for precision sharpening. 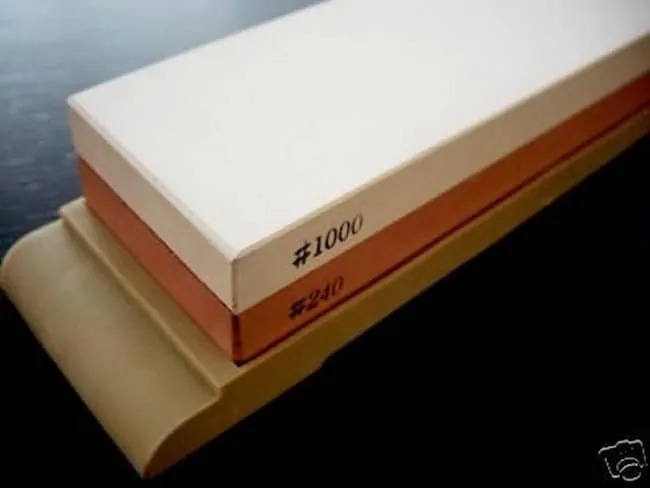 The set contains a #1000 Grit(“Arato” Coarse), #3000 Grit(“Nakato Shiage ” Finishing Stone), and #8000 Grit(“Shiage” Fine Finishing Stone). Nagura Conditioning Stones are also supplied for the really fine detail work. 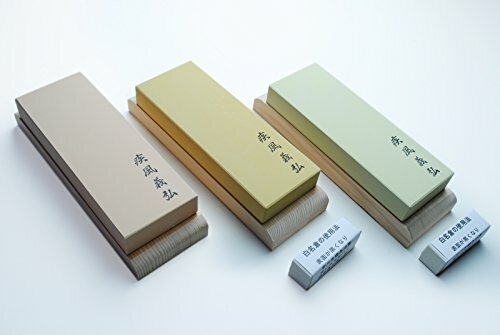 An exceptional Japanese whetstone package from one of the most respected brands around today. It is important that you begin your sword maintenance somewhere where you will not be disturbed, have plenty of space to move and lots of natural light. You should have the sword placed on an open work top or table, and using the wood, prop the sword into position and stabilize it. Using the file at a 30 degree angle, you then need to begin shaping the edge of the sword. Ensure to count the strokes as you work, allocating the same amount on each side of the blade. Keep applying the file while turning the blade over until you have created a rough edge on each side. To clarify these instructions further, the video below gives a complete 18 minute tutorial on how to sharpen a sword. Now it is time to get to work on your sword with a whetstone. 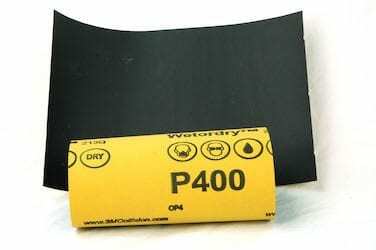 The whetstone is the tool you are using to polish your blade edge until it becomes sharp. Using a 30 degree angle, you will need to pass the blade over the stone – again counting the amount you are applying on each side so that the sharpening process is uniform. It is important that you use a back and forth motion over the stone. Do not use a circular motion. Inspect the blade often (hence the need for lots of natural light – you will want to get in there and inspect closely to ensure the edge is exposed to your liking), to ensure you haven’t missed any spots. And now it is time to use the sandpaper. 400 grit is best used on your sword and will help blend in the newly sharpened edge to the rest of the metal, for a beautiful high-grade finish. Run the sandpaper along one edge of the blade, using your finger at a 30 degree angle. The sword will be very sharp at this point, so be careful not to slip your finger across the edge. You will cut yourself if you do. Finally, some sword owners like to wipe down their blade with a water / vinegar mix. This disguises the sharp finish by giving the metal an aging brown color. Needless to say, you should be careful and patient when sharpening a sword. Choose a place and time that you will bot be distracted, and pay 100% attention to the task at hand. Unless you are very experienced, don’t attempt to sharpen antique swords. This should be carried out by experts. You could very likely reduce their value by attempting to restore the edge yourself. It is best to get some practice on something cheap and cheerful first. If you have more that one sword, certainly sharpen the less valuable one first. Don’t use power tools on your swords. 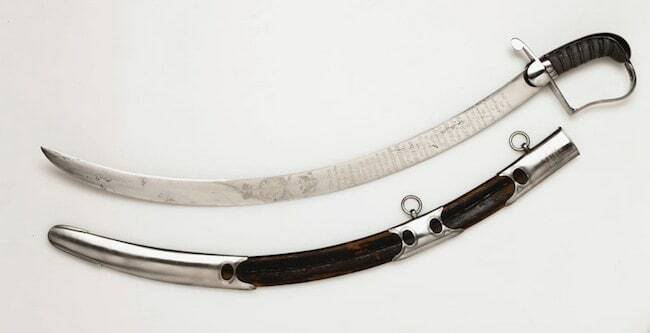 The friction can heat up the blade, ruining the swords temper and heat treatment. For alternative ways of sharpening a sword, there is a really good resource over at sword-buyers-guide.com.